A photo of the Permian Triassic (PT) boundary at Meishan, China. The environment can produce sudden shocks to the life of our planet through impacting space rocks, erupting volcanoes and other events. But sometimes life itself turns the tables and strikes a swift blow back to the environment. New research suggests that the biggest extinction event on record may have been initiated by a small, but significant change to a tiny microbe. "The end-Permian is the greatest extinction event that we know of," said Daniel Rothman, a geophysicist at the Massachusetts Institute of Technology. "The changes in the fossil record were obvious even to 19th Century geologists." Understanding the cause of this biological devastation requires understanding the geochemical clues that go along with it. Chief among these clues is a sudden swing in the balance of carbon isotopes stored in rocks from that same time period. 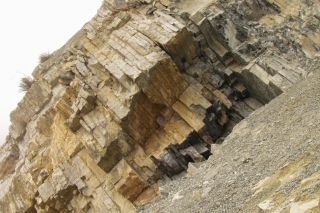 If geologists can find what disrupted the carbon, they'll likely know what killed off so much of the Earth's life forms. Several theories have tried to explain the carbon perturbation as, for example, massive volcanism, or a drop in sea level, but none of these environmental causes have fully matched the data. Rothman and his colleagues have identified a different culprit — one coming from biology rather than geology. They argue in the Proceedings of the National Academy of Sciences that the carbon disruption and, consequently, the end-Permian extinction were set off by a particular microorganism that evolved a new way to digest organic material into methane. With this genetic innovation, these methane-producers, or methanogens, ran rampant across the ocean, overturning the carbon cycle. The resulting changes in ocean chemistry would have driven many species to extinction. "This shows how unstable Earth's systems are," Rothman said. "A very small event in the microbial community can have an enormous impact on the environment." The basis of this new theory comes from a reassessment of the carbon data. For decades, geologists have been aware that the ratio of carbon isotopes (the light verses heavy forms of the element) changed abruptly in geological samples around the time of the end-Permian event. Specifically, the carbon stored in rocks tilted towards the lighter isotope by about 1 percent over a matter of 100,000 years. Rothman and his colleagues re-analyzed these isotope fluctuations, incorporating them into a model of dynamical exchange between different reservoirs of carbon material. The results showed that the level of carbon dioxide in the ocean rose faster than exponentially. The increase was slow at first, but picked up pace as time went on. Rothman and his collaborators argue that no geological source can adequately explain the dramatic growth of carbon dioxide. One popular theory has been that high levels of carbon dioxide were released by massive volcanic eruptions in Siberia, which lasted for a million years and covered a million square miles with lava. "It's hard to get the arithmetic right with just volcanoes," Rothman said. He and his fellow authors believe an additional input is needed – one coming from biology. A burst in biological activity could explain the exponential-like growth in the ocean's carbon dioxide reserve. Exponential-like growth is not uncommon in biology. Certain invasive species, for example, experience population explosions once they enter a new ecosystem. Similar types of expansion can occur when an evolutionary development gives a particular species a leg up on its competition. The authors contend that some sort of biological innovation altered the distribution of carbon in the ocean. And they assume that the ocean was, in some sense, waiting for this innovation with a large reservoir of organic material (the detritus from dead organisms) in the ocean sediment. "Other research has shown that during the end Permian, these organic products had accumulated to very high levels, probably due to a slowdown of normal degradation," said Greg Fournier, a co-author also from MIT. This organic sediment was like "a big pile of food" for an enterprising organism to exploit. Fournier had a clue as to what sort of organism this might be. From previous work he had done as a NASA Astrobiology Institute (NAI) postdoctoral fellow, he knew that a major innovation occurred around this time period in a type of methane-spewing archaea called Methanosarcina. This methanogen is currently found all over the place, Fournier says, with species inhabiting marine and freshwater sediments, soils, sewage, and even inside the guts of animals such as cattle, where they produce a lot of the methane released into the world. Part of Methanosarcina's success is due to the fact that these organisms can process acetate, a common organic residue, faster than some of their methanogen cousins. Basically, the Methanosarcina are able to get more energy out of the conversion of acetate to methane. Fournier had earlier shown that Methanosarcina had acquired this ability from horizontal gene transfer. In some long-ago microbial tryst, an ancient methanogen (which produced methane as waste) swapped genes with an ancient cellulose-eating bacterium (which produced acetate as waste). This genetic "technology transfer" created an organism that could more efficiently metabolize acetate. To obtain a more precise date for when this microbial innovation happened, Fournier and his colleagues performed a rigorous genetic analysis. "We compared genomes from a variety of different methanogens and dated the evolution of this [new metabolic pathway] by using a calibrated 'clock' that counts the changes accumulated in genes over time," Fournier said. The results placed the gene-swapping event at 240 million years ago, plus or minus 40 million years. "The molecular clock analysis simply confirms that, to the best of our ability to measure, the timing is consistent with [the end-Permian event]," Fournier said. If indeed the genetic innovation occurred in the late Permian, then it's reasonable to assume that the Methanosarcina population began to multiply. Much of the methane produced by these organisms would have converted — through oxidation reactions or biological processing — into carbon dioxide, causing a rise in the carbon dioxide levels of the ocean. The conversion of methane into carbon dioxide would have had a secondary effect as well: it would have driven down the amount of oxygen in the ocean water. Because Methanosarcina is anaerobic, the reduction in oxygen would have helped them thrive even more, creating a positive feedback loop. This could explain the faster than exponential growth in carbon dioxide concentrations that the authors observed. As previous scientists have argued, the high levels of carbon dioxide would have led to a more acidic ocean, which would have been especially deadly for shell-bearing lifeforms. And like a house of cards, many other species followed suit. A plot of data on mass extinctions in Earth's history. The end-Permian extinction event is the large peak on the left at 250 million years ago. One possible sticking point is that exponential-like growth often gets ahead of itself and becomes a victim of its own success. In biology, overgrown populations tend to run out of food or some other resource. In the case of methanogens, this limiting resource might have been the element nickel, which these organisms need to produce metabolic enzymes. The levels of nickel in the ocean are not typically very high. "If methanogens were to become active, they could be limited by nickel," Rothman said. However, when the team checked nickel concentrations in late Permian geological samples, they found a spike that corresponded with the carbon isotope fluctuations. The source of this high nickel abundance was most likely the massive volcanic activity in Siberia, where the world's largest nickel deposits are located. That spike in nickel allowed methanogens to take off. "It's a nice confirmation because it closes a circle, so to speak, by bringing the story back to volcanism," Rothman said. Who gets the blame finally? "It is a novel idea that will need a lot of testing to see if it has 'legs'," said geologist David Bottjer of the University of Southern California, who was not involved with this work. The arguments seem valid to him, but it will take some time for "the process of science to unwind as we see how this new idea stands up to earlier proposed mechanisms." Rothman said they are currently studying whether the methanogens may have left some sort of biomarker, for example an organic compound, which could provide further support for the scenario. "[The authors] have done a really nice job linking the latest geo-chronologic age constraints on the duration of the extinction to the changes in the carbon cycle," said paleontologist Douglas Erwin of the Smithsonian Institution. But Erwin thinks the emphasis on methanogens is misplaced. "Their suggestion that the PT [extinction] was instigated by a 'specific microbial innovation' suggests a misunderstanding of causality," he said. To his thinking, volcanism is the ultimate cause, since it triggered the methanogen growth by creating favorable conditions. Rothman admits that's one way to look at it, but he doesn't think the volcanoes (and their release of nickel) were necessary for the explosive microbial growth. Instead, he calls the volcanism a "catalytic event" that helped propel the genetic innovation. "There is a random component to biological evolution," said Fournier. "This gene transfer occurs by chance, but is only selected for and expands through a population when it conveys a specific advantage, which would be realized under those conditions [brought on by the volcanism]." Either way, it's impressive how interdependent all these different elements appear to have been. "The clear implication is that life and the environment have co-evolved," Rothman said.